Going digital is just a necessary transition for schools and universities everywhere. Multimedia is increasingly this generations medium of choice for communication. Incorporating this though digital signage on your school wireless network will allow you to get more students engaged and increase the power of your message. Today’s digital signage is affordable, multimedia rich, and very easy to use. Here’s what to expect when you’re expecting digital signage on your school wireless network. Digital signage can save you a lot of money on print costs. Banners, print ads, and posters can all be replaced by a much more appealing sleek flat screen. It can also be used to advertise things like bookstore sales, lunch specials, fund-raisers, and other events used to raise money for the school. Ok, it may sound odd, but your school will be a safer place for students, staff, and guests with digital signage. Think about, with one click emergency alerts and public safety information can be delivered to every digital sign in every hallway, dining area, and lounge instantly. You can have it set up to where each screen shows specific emergency routes for each area to efficiently guide everyone to safety. Keeping all the faculty up to speed with the latest training and safety information can be quite a daunting task, especially at large schools and universities. With a digital signage solution on your campus or school wireless network you can place displays in faculty lounge areas and display messages and training information there. This way the information is provided in a more convenient manner without interrupting their busy schedules. Encourage good conduct and hard work by displaying information on honors and awards on digital signs. Students that work hard and are awarded or receive honors should be recognized. Students are more likely to put forth more effort and feel better about themselves if they are recognized for their hard work. Displaying students’ accomplishments, awards, and hard work on digital signage is a great way to increase student morale and encourage student success. Digital signage is designed to supplement traditional communication like poster boards or intercom announcements. Instead of just announcing the scores of last night’s football game over the intercom, you can get everyone more excited and increase school spirit by showing game high-lights and cheering fans. If you show students how much fun they missed out on by not going to the game or event, then you are a lot more likely to get more students involved and pumped about the next event. Who would of thought that just some digital signage could help build such a strong enthusiastic school community. 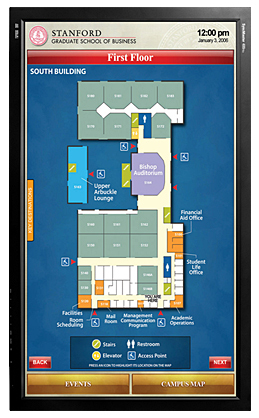 A digital signage solution is a great way of providing wayfinding maps in the lobby and other high-traffic areas to assist new students and teachers, parents, and visitors in finding their way through out the facility. If you’ve got a large school campus, this can be extremely helpful. Digital signs can provide students with constant reminders about important dates like test times, schedules, and meetings. With the information flashing across the screen right in the hall students will be better informed have no excuse for missing anything. 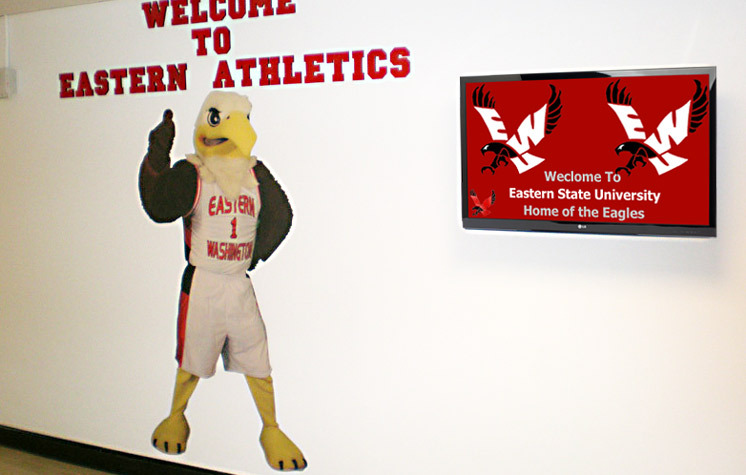 Overall, digital signage is an excellent way to stay connected with your students, faculty, and staff, and make sure they get the need-to-know information to make them successful and improve your school. 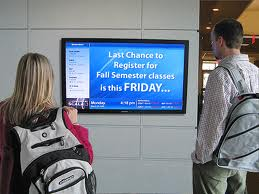 If you have not already and are ready to get a digital signage plan rolling for your school, we can help. Check out our free digital signage solution checklist you can download to help you gather all the information to get started. You can contact one of our AV experts here, they are always more than happy to answer any of your questions and give you a free consultation. The many benefits are clear, but there is a lot to consider when preparing your school wireless network for a digital signage solution. Our goal is to be a resource for you. Good luck!